It is a battle long overdue.? 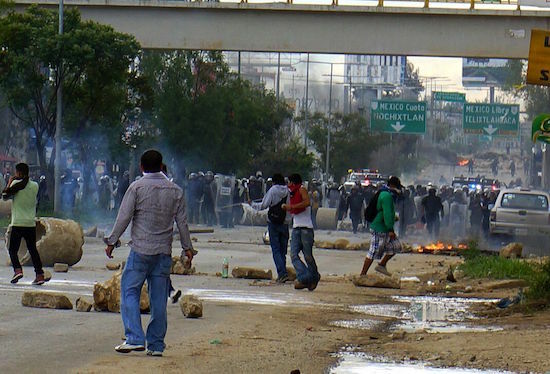 In Oaxaca people knew that many aspects of the ongoing confrontation were being postponed due to the elections. It was evident that after the elections, the attacks, provocations, and the final assault would intensify. Everywhere, preparations began. The march that arrived at the central plaza of Oaxaca on June 14th exemplified the experience. Over the course of almost ten hours, beside the teachers camping out in the square, very diverse sectors of society creatively expressed the ways in which memory inspires action today. The Civil Space is a new manifestation of collectives, organizations and groups of very diverse characteristics that reclaim the experience of 2006 to give it new forms. Their pronouncement, “10 years constructing new paths,” was formulated in the context of government violence “for the purpose of imposing the misnamed educational reform” and also in the context of an exemplary teachers’ and popular resistance in the face of imminent risk that the repressive black night of repression that we lived on November 25, 2006 would be repeated. 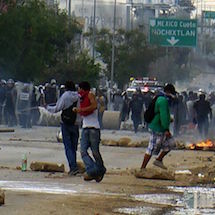 Since that day, they began to blockade the roads. 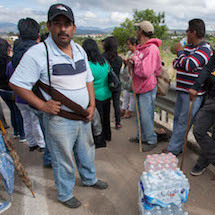 In Nochixtlán and in the Isthmus, the people went out into the streets to block the trucks filled with militarized police that headed to Oaxaca City, from whose airport they had begun to arrive. Many thousands of people, of all sectors of society, fed and supported the blockades and began to weave networks of solidarity. Oaxaca is burning. There is a clear consciousness of this moment of danger. Therefore, from every corner, we appeal today to the anger that expresses the moral indignation that a growing number of people share, as well as that which stands for bravery, integrity, and the ability to walk with dignity and clarity in these dark times. The battle has just begun.